Through their outstanding compassionate activism - most notably through the creation of Share Our Selves 45 years ago - Frank and his wife, Jean, have left an indelible imprint on our community and all of Orange County. Despite his illness Frank continued to influence issues in the city - most recently speaking out against the current plans to demolish the Neighborhood Community Center and create a new library in its place. Frank Forbath was an engineer by training and profession. He held a B.A degree in physics and math from UCLA and a Master's Degree in electrical engineering from Stanford University. 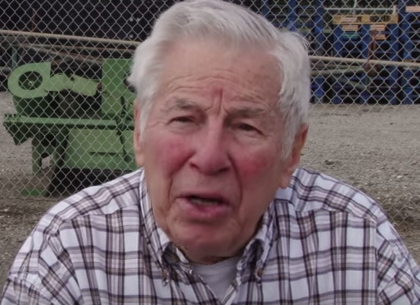 Frank served as a shipboard Naval Officer in World War II. He held management positions in many of the iconic companies in Southern California, including Hughes Aircraft and Northrop and held engineering positions at the Instrument Division of American Optical and the RAND Corporation. He has been the President of FJFCo and Harbor Scientific and holds several US and International patents. And those were just his day jobs! Frank and Jean have lived in Costa Mesa for more than 53 years, raised seven successful, well-educated children, have been loving grandparents to fifteen grandchildren and still found time to perform a level of community service that would be hard to match. This short video clip will give you an idea of that dedication to the community. We at A Bubbling Cauldron extend our deepest condolences to the Forbath family, to the staff and those served by Share Our Selves, and to the community as well, on the loss of this fine man. His was certainly a life well-lived and he will be missed. R.I.P. Frank Forbath. We need more human beings such as yourself. You will be missed. Thank you so much for your post Geoff. My father was greatly loved. My mom has asked that in lieu of flowers, donations be made to Save Our Youth (SOY) in his name. Geoff, what a beautiful tribute to our dad! Thank you. Dad believed a single person can change the world for the better. He showed us the truth of that belief. He has made Costa Mesa, and Orange County, a better place through a lifetime of working for justice. His legacy includes co-founding SOS, bravely challenging the abysmal treatment of migrant farmworkers at the farm labor camps right here in Orange County, protesting against the wars in Iraq, and leading the local political campaign ("No on 14")to end racial discrimination in housing way back in the 1960's. That's just a bit of what he's done. He is a hero to his children and grandchildren. Thank you for highlighting his contributions and sharing in our sadness in his passing. What a wonderful family. Mr. Forbath and his wife set a great example for others to follow. Geoff, thanks for sharing. The Forbaths represent what is good about human nature. Compassion and service are values they exemplify. Their contributions set an example for all to follow. My love and deepest sympathy to Jean and her family. I'm sorry, my earlier comment posted as anonymous. My mom would like donations to be made to the National Farworkers Ministries, though SOY and SOS were also very important in his life. I didn't have to know much about Frank Forbath to sense that he was a truly good and caring man. We were lucky to have him among us. Truly, he will be missed. What an amazing guy. So glad we had an opportunity to meet him. His contributions were amazing and his family more so. God bless.